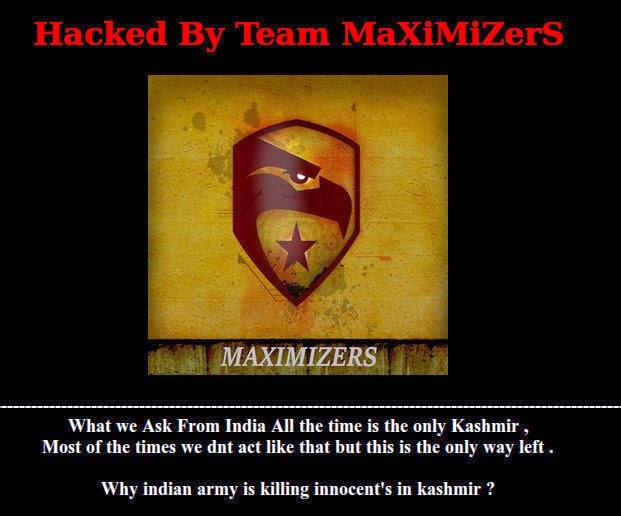 Hundreds of Indian websites including two Kerala state Government websites have been breached by a Pakisani hacker group identifying itself as "'Team MaXiMiZerS"
The affected websites are Cooperative Institute of Management and Technology (cimat.kerala.gov.in) and Kerala Cultural Welfare Development(cwb.kerala.gov.in), Kerala's Kannur University (kannuruniversity.ac.in). The defaced websites displayed the message "What we Ask From India All the time is the only Kashmir , Most of the times we dnt act like that but this is the only way left . Why indian army is killing innocent's in kashmir ? We Just Ask you these simple Question's and the indian gov got no answer's..... why ?" "This is the only way left to protest for us. For what you are scared of ? India will loose the beauty of kashmir ? how many muslim brother's being killed on daily basis did u ever thought ? a 16 year's girl raped and killed a boy shot in the head for what ? because they are protesters ?All we ask is just the Answer of these Questions Nothing Personal ...you will pay for these sins one day"